There is a very significant reason why Pulmonary Fibrosis Awareness Jewelry is designed in red and blue colors. To find out why, read our jewelry article on Why Red and Blue for Pulmonary Fibrosis? Such an inspiring story! Wouldn't you agree? 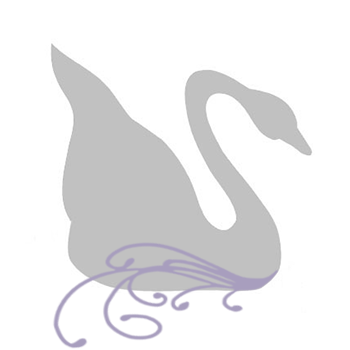 Crystal Allure is a proud supporter of raising awareness of Pulmonary Fibrosis and lung disorders. That can be seen in these beautiful handmade awareness jewelry pieces in support of Pulmonary Fibrosis Awareness. You will be going blue (and red!) for Pulmonary Fibrosis with either (or both!) of these Pulmonary Fibrosis Jewelry pieces. 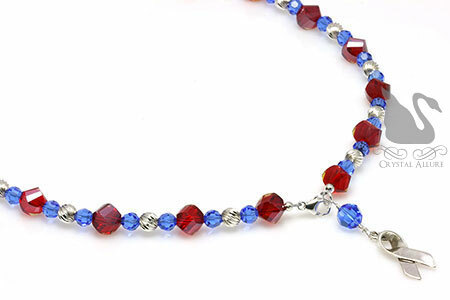 Handmade beaded anklet raises awareness of Pulmonary Fibrosis and features a split design of red and blue seed beads, centered on the ankle bracelet is a sterling silver awareness ribbon bead and .925 Bali beads. Finished with our signature jewelry tag. Measures 10-3/8". This beautiful handmade beaded Pulmonary Fibrosis ribbon charm awareness necklace is one of a kind. Design features sterling silver round twist beads, blue sapphire Swarovski Crystals, step-faceted high quality contemporary-cut ruby red Czech glass beads with sterling silver lobster clasp leading to a 1" awareness ribbon charm pendant. Total length of pendant drop is 1-3/4". Necklace measures 18-3/4". The versatility of this design allows you to wear the Pulmonary Fibrosis awareness ribbon charm pendant in the front or if you are wearing a tank top, put the ribbon in the back for a unique twist!